What is the ISTEXT Function? The ISTEXT Function is categorized under Information functionsFunctionsList of the most important Excel functions for financial analysts. This cheat sheet covers 100s of functions that are critical to know as an Excel analyst. The function will test if a given value is a text string or not. If the given value is text, it will return TRUE, or else, FALSE. In doing financial analysis, if we want a particular file to input text values only in a particular cell, using this function along with data validation will help us do that. Value (required argument) – It is the given value or expression that we wish to test. The value argument can be a blank, i.e., an empty cell, an error, a logical value, a text, a number, or reference value, or a name referring to any of these. 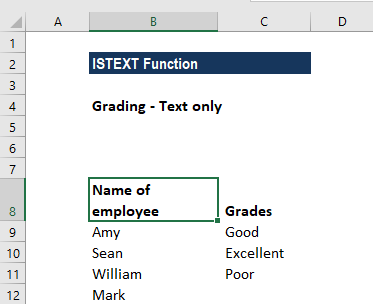 How to use the ISTEXT Function in Excel? 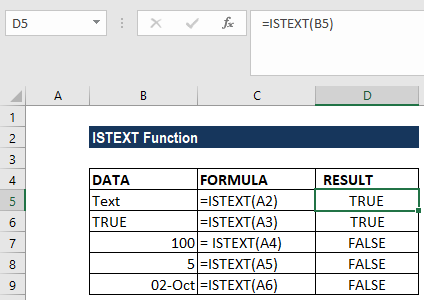 As a worksheet function, ISTEXT can be entered as part of a formula in a cell of a worksheet. As we see above, when we apply the ISTEXT formula, we get the result in the form of TRUE or FALSE. Suppose we wish to allow only text to be entered in a particular cell. In such scenario, we can use data validation along with ISTEXT to get the desired results. 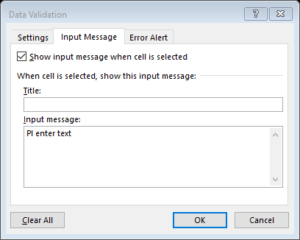 We want only text to be entered in column C9:C12, so we apply data validation to the cells. The formula to be used would be =ISTEXT(B9). If we want, we can input an error message. Click on Input Message and type the message on the Input message box. Now, Data validation rules are triggered when any user would add or changes a cell value. 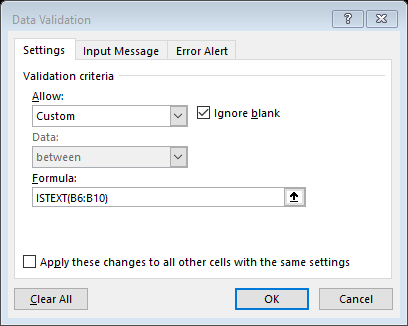 Cell references in data validation formulas are checked for rules defined in data validation. 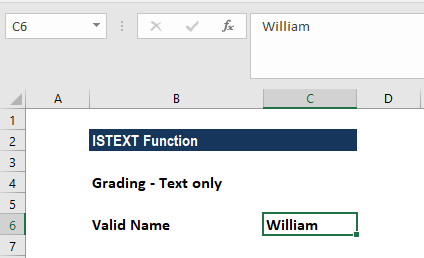 The ISTEXT function returns TRUE when a value is text and FALSE if not. As a result, all text input will pass validation, but numbers and formulas will fail validation. Now if we try to input a number, we will get an error while a valid name will be accepted, as shown below. 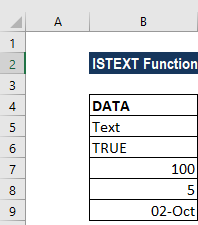 The ISTEXT function is available in MS Excel 2000 and later versions. The function will return FALSE even for formula errors such as #VALUE!, #NULL!, etc. ISTEXT belongs to the IS family. We can use an IS function to get information about a value before performing a calculation or other action on it.